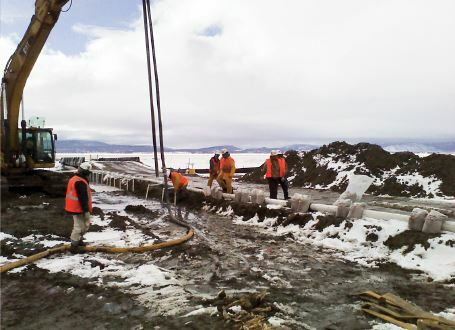 Construction began late 2010 on 680 miles of 42-inch liquid natural gas pipeline connecting Oregon to Wyoming. As part of a $3.5 billion investment, the pipeline was constructed in segments. A section of the buried pipeline was horizontally bored 17 feet underground and passed under a small river in the depth of winter. 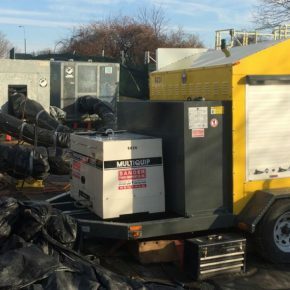 The contractor needed an efficient and environmentally safe dewatering team to work with them through native tribal lands. The pipeline contractor chose Rain for Rent Portland to work on a Southeastern Oregon section based on demonstrated expertise and previous dewatering experience. 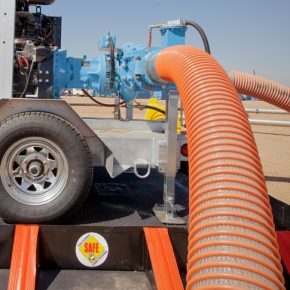 The applied solution overcame muddy terrain and an average frigid temperature of 8 degrees Fahrenheit, along with an average five-foot water table. 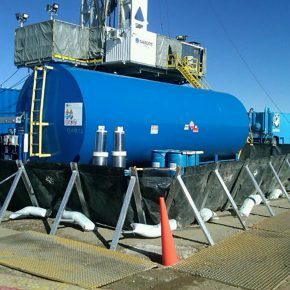 Dual 75-point wellpoint dewatering systems were used to accommodate boring for the pipeline. 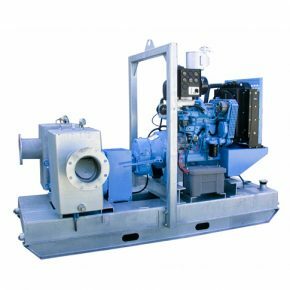 Each of the systems dewatered at a rate between 650 and 800 gpm with three RL-200 eight-inch pumps driving the swing-arm wellpoint system for more than six weeks. Rain for Rent was commended for efficient design and installation as boring continued and finished on time. Careful attention nwas paid to safety by Rain for Rent conducting daily job site analysis and tailgate meetings, along with weekly safety reviews. The pipeline construction has since moved to Idaho where Rain for Rent Nampa has been tasked to provide solutions for that unique territory. The pipeline owners expect to begin service this summer.